The Feral Jackal Inn creaked with the somber sigh of old age as it snoozed amidst the light morning drizzle. The grey of the fog enshrouded any obvious signs of disrepair on the building, but even so the building drooped with an imperceptible weight. Dreary as it was, Kopek found the sight to be a welcome one. He wasn’t sure if he missed cooked meals or friendly, human faces more, and the rain certainly didn’t improve his mood. As he opened the door, the soft hum of rain in the trees transitioned into the loud barks of dismay as an older man yelled in an otherwise quiet room. Kopek shook the wet off himself a bit as he closed the door behind him. The barmaid—or presumably the owner of the establishment—was a middle-aged woman whose face matched the walls and space around her. Her friendly smile showed signs of thinning patience. The man she had been speaking to wore thick, muddied furs, and his brown hair was losing the battle of years. He turned to see the newcomer, and as soon as Kopek saw his face he immediately recognized the man as a fellow Ormen outlander, Bardam. “Kopek?” he murmured, tilting his head like a dog a bit. “Like a drink?” the barmaid asked, pulling a rag from her apron. She rolled her eyes, but pocketed the money in silence before setting to wiping down the counter top. Bardam looked at Kopek, and the dead intensity of those eyes spoke of a new decade of age the man had yet to live. Kopek watched as the words formed on his lips, then died as he broke the gaze by returning back to the stein. “Undoing take you,” Bardam muttered. Kopek sighed. This wasn’t exactly the conversation he had hoped to be having today. Still, it was better not to push, and a familiar face was company enough. Kopek dropped the subject and turned his attention to a nearby window. The soft din of the outside rain fell into pace with the sound of the barmaid’s work. It wasn’t ideal, but he was at least happy to be indoors. Kopek caught the barmaid stealing glances at the two of them, and she turned her attention to the table once more. “I did find her,” he said. It wasn’t good news. “So there I was, sitting in one of the trees at Backarrow Park waiting for… I don’t know, something, when this old lady comes along with a picnic basket. It was a normal day, nice and breezy, the trees shielding the park-goers from any harsh sunlight. Not that the sun is harsh, though I suppose sometimes it is, but it wasn’t this day. I just think that if people are going to be out and about, they like to be in daylight, but not blinded by the sun, you know? “Anyway, this old lady comes towards me with a picnic basket. Well, not towards me, but in my direction. She didn’t see me. Basically nobody sees me because I’m so small, you know? Well, of course you know that. You’re as small as me. Not that that’s a bad thing. Where was I? “Oh, yeah, Old Lady Picnic. So she sits down under the tree I’m in and takes out a little blanket from her basket. She unfolds it and lays it on the grass. It’s this cute pink and white quilt patterned with baby elephants and rabbits. Stars above it was the most adorable thing I had ever seen. She probably made it herself! I would never sit on something like that. A work of art like that should never be laid on the grass. But she put it there and started taking out food. Bananas, tiny sandwiches, potato salad, and a gorgeous apple cinnamon pie, and in that moment I knew that if that pie was half as good as it looked and smelled, I would die a happy fairy, wings earned or no. Have you ever felt like that? Where you’re so sure of something that hasn’t happened yet? What am I saying, of course you haven’t. “So she takes everything out and starts looking in her basket for something. She doesn’t take anything else out, though. Maybe she forgot something. So she gets up and starts walking back the direction she came, and at first I think ‘Hey, she won’t notice if I steal some of her pie, that’s a lot of pie. She can’t eat it all by herself’, but I didn’t want her to see me and I didn’t know how long she’d be gone, so I decided to wait. “Well, I waited for like an hour, or however long a really long time is for humans, but she never came back so I started to get worried. And then, disaster struck! “Flies started coming out of the woodworks. Or, well, I don’t know, the sky. I don’t understand human expressions. 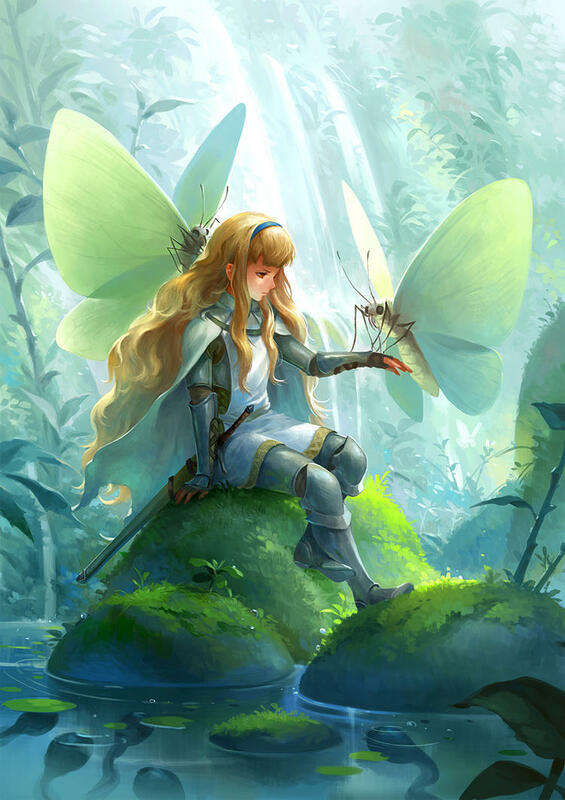 Anyways, they were coming for Old Lady Picnic’s food, and I knew then and there that this was it: the valiant effort that would earn this little fairy her wings, and, more importantly, the right to go back to Fae. 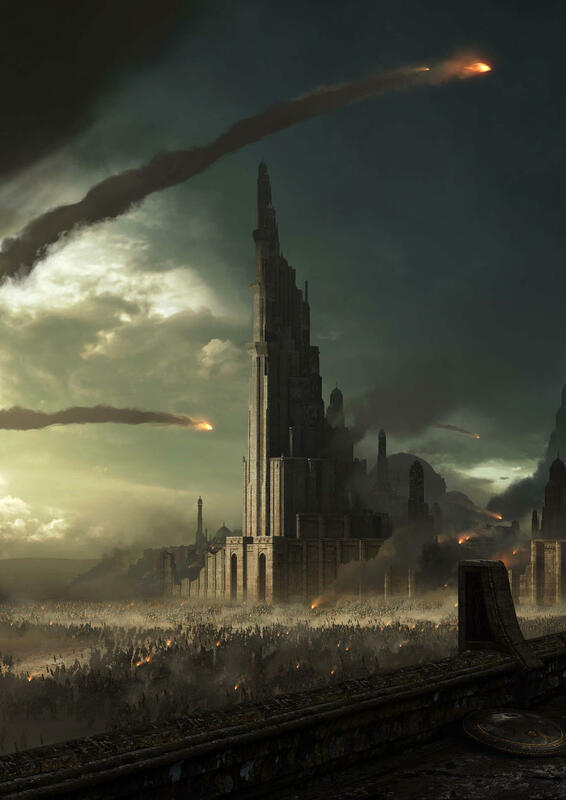 “They came at me, all eyes and loud wings buffeting the area. Our battle was one for the storybooks as I fought them off one-by-one, trading blows on the top of the narrow basket handle. They spat their toxic acid on me, rusting my armor and breaking some pieces off entirely. I was careful to keep my sword away from it, though, lest my attacks be rendered useless. “Needless to say, I won. My foes were forced to retreat, some hobbling away with torn wings or eyes. I held no remorse for the savages, bent on taking advantage of Old Lady Picnic’s absence. “Just when I thought that victory was within sight, however, the ants came. Legions of them, marching down the tree I had just been sitting in. I suppose they must have been army ants, with their perfect formation. As valiant as a knight as I may be, I knew I couldn’t fight a whole legion. The magic of Songs’ performance flowed like gentle currents of winds throughout the Laughing Escape Inn. Unlike many of the taverns in the lower district of Three Rings, people came here to enjoy the performance accompanied by food and drink, not the other way around. As always, the tabaxi bard kept silent, letting the bow and strings tell the tale. This one was about the Feywild—about dancing faeries zipping around trees and grass as they played with other winged friends without a care in the world. Most of the simple folk here would never have been to such an exotic place, and Songs was happy to share a piece of his experiences. This was what adventuring was all about. Not for the glory or the wealth, but for the stories. Another peculiarity of the Laughing Escape Inn was the total silence beyond the music. There wasn’t an empty seat in the entire building, and yet each human, elf, and dwarf sat in an enthralled silence as they watched the ethereal faeries dance around them, their tiny forms landing on patrons’ shoulders and kissing them on the cheek before dissipating into nothingness. As the song neared its conclusion, he nodded his respect to the creatures that accompanied him on his performance. 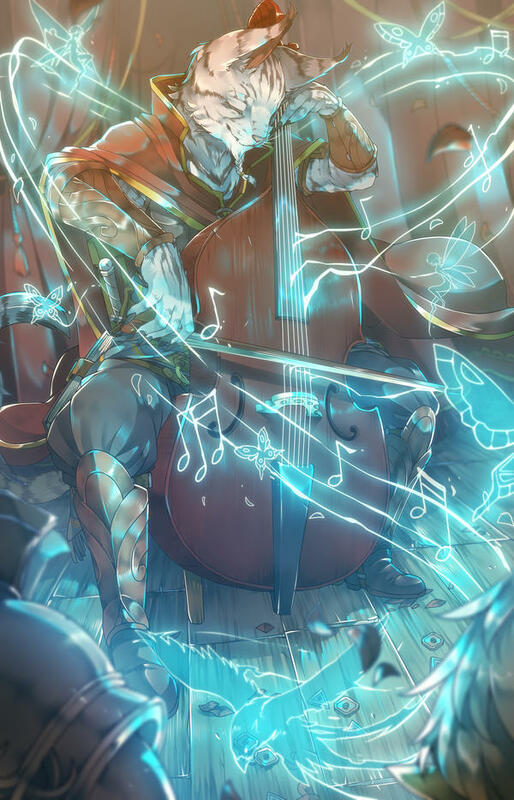 They were mere manifestations of his memories, given life through his magic, but he still felt it important to show respect to those that had given him those memories, for without them there would be no music at all. At least, not any worth listening to. The magic faded, and the weaves of blue light disintegrated into streaks of dust where they fell, an unintended side effect of Songs’ magic. The people paid it no mind, however, and the tavern erupted into an applause as relaxed and respectful as his performance. This wasn’t the place for cheering or shouting. Songs stood from his chair and bowed, a self-satisfied grin on his face the whole time. He began putting his things away and pushed his coin purse forward to encourage donations, leaving it on the stage while he approached the bar. It wasn’t that he trusted the customers—they were as apt to steal as anyone else—but the amount of money he’d collect on any one night was a paltry sum. It was nothing compared to the money he had accrued from his travels. “Well, I do. Who do you think has to clean it up when you’re gone?” he huffed, passing him a stein of Songs’ favorite honeyed whiskey. “I’d be happy to take my business elsewhere if you wish,” Songs smirked, knowing full well that neither of them had any real desire to end this partnership. Songs considered that. “I could set something on fire if you like. Perhaps one of your esteemed guests?” A dwarven guest came to the bar and ordered something, eyeing Songs with a suspicious glare as he said this. Thakros found the dwarf a filled stein before returning his attention to the tabaxi. Captain Hadrus adjusted his sunglasses as he looked sunward over the valley. 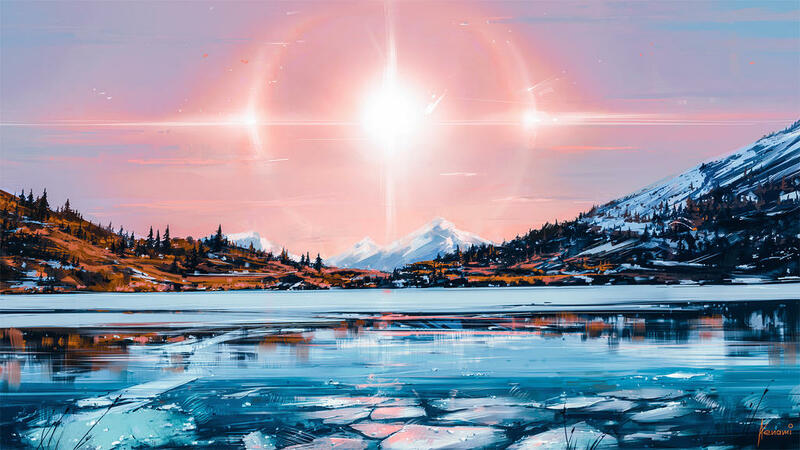 The lenses blocked out a vast majority of the sun’s brilliance, but even so he could make out the dim outlines of the horizon and the reflection of the sun off the lake. A good day for hunting, he thought. Which means it’s a good day to be hunted, as well. He put a hand on Engineer Paddock’s shoulder, signaling for her to stop. When she did, he drew a finger along her back in swift, precise motions, telling her to stay close, keep quiet, and have her weapon ready. They were far from the cities, and so silence was key. With the sudden appearance of this intensely bright new sun, the world had changed. Eyes became almost useless, because the second sun never moved, and so the concept of ‘night’ was a thing long forgotten. And so, the other senses took precedence: hearing and smell became the favorite means for predators to find food. Humans were no longer top of the food chain. Hadrus rolled his eyes at the request, but acquiesced. After all, part of the reason he had brought her along was because of how careful she was—you could count on things going smoothly around Paddock. He pulled out his crossbow and handed it to her, watching as she examined the bowstring and the limbs, pulling a cloth out and cleaning the polished wood of any dirt. She inspected the weight of the drawback and did a cursory scan of everything else, making sure that the settings were all correct and that the string wouldn’t snap as soon as he fired. When she was satisfied, she handed it back to him with a curt nod. Once that was settled, the two of them turned sunward once more and made their descent into the forest below. As always, it was quiet, and the two of them were careful not to make their presence known, treading on soft dirt and moving slowly. In centuries past this forest would have been rife with wildlife, with birds chirping and all manner of insects buzzing. Hadrus had heard stories in a world that went dark half the time—not so dark as wearing the sunglasses, but dark enough to have trouble seeing even without them. He never really understood what that would do to an ecosystem, where predators could track by movement and didn’t need to rely so much on sound or smell. He kept scanning the area ahead as he drew out a bolt with his free hand. Half a step ahead of him, he saw Paddock taking out a bolt of her own, sliding it onto the barrel of her own crossbow. Once their weapons were loaded, he took a pair of pebbles that had been packed neatly at his side so they wouldn’t make sound with his movement. His hands were full now, so he couldn’t talk to Paddock, but his previous command deemed further instruction unnecessary. The pebbles hit something soft, and it was followed by the sound of a low, huffing grunt. They had directly hit their target, which had alerted it to their presence. The creature huffed again, its huge claws scraping the ground as it paced. Towards them presumably, and a bear by the sound of it. Hadrus exhaled slowly and quietly. Since the bear didn’t move to investigate the pebbles, there was no reference to get a clear shot at it, and the dark outlines of the forest made it all but invisible. A soft click and a snap, and the bear roared in pain. Paddock had fired, and the bolt hit its mark. The bear charged, and Hadrus clearly saw its outline as the hulking shape suddenly grew enormous. The element of surprise was gone. Hadrus fired, but it didn’t seem to hit. Paddock screamed in terror as the thing crashed into her, their dark outlines blurring into one. The grunts of the bear collided with Paddock’s hushed gasps of panic. Hadrus fumbled for another bolt as he heard a sickening slash. “Oh God,” Paddock cried. “My glasses! I can’t see!” The sound of her voice here sent a chill down Hadrus’ spine. Hadrus fired again, aiming high to minimize the chances of hitting his ally. In the sound of the scuffle, it was impossible to tell if he had actually hit. The only thing to do was load again. Paddock’s cries continued, and Hadrus kept firing. The chaos of the scuffle lessened, and soon the bear started to lumber off, evidently too wounded to want to stay. This went to Hell really fast, Hadrus cursed. No deer or foxes, but a bear? There was no hope of bringing back food now. Little hope of bringing back Paddock alive, at that. “How bad?” he asked aloud. There was no use for silence now. He nodded. They had to get back to the city fast. “Here,” he said, taking off his glasses off. He shut his eyes immediately, but even through his eye lids the intensity of the second sun was uncomfortable. The breeze sent a chill down Merideth’s spine as she waited beneath the tree for the sun to set. It still had a ways to go. The nights came later now that daylight savings had passed. She didn’t know how to feel about that. The only emotion she really felt was weariness, but then, that was every day. The tree made no reply, as right it oughtn’t. There was a structure to the world, and talking trees simply did not fit. Merideth spun around, expecting to see the tree miraculously sporting a trench coat and scarf. Instead, she saw a man with a trench coat and a scarf, tipping his hat as he walked up the far side of the hill towards her. “Just the bit about the cold, I’m afraid,” the stranger replied. He sounded American. “You must think me daft,” she smiled, scoffing a bit at her own embarrassment. “No, but you do seem to be struggling with the draft.” He emphasized the last word to rhyme it with her pronunciation of ‘daft’. She eyed him, not sure what to think about his peculiarity. “Hello, I’m Raymond Stenton, by the way,” he added with a wink as he extended a hand out. “Merideth,” she replied, taking it. Merideth folder her arms. She wasn’t in the mood to talk to strangers. Especially not one like him. And yet there was something about his presence that seemed… genuine. She chuckled at that, and Raymond’s eyes lit up. “I’m not sure you’ll get very far,” she said. “I can’t imagine that leaves much time for anything else,” she reasoned. 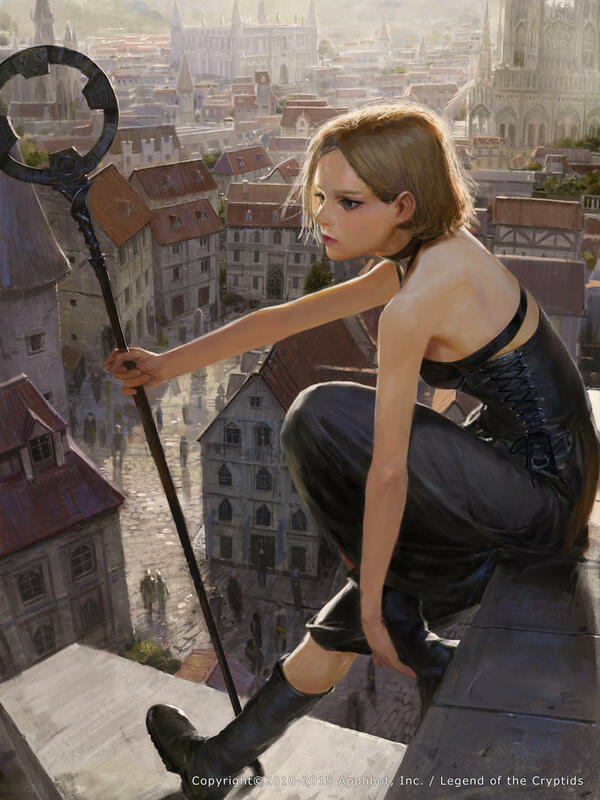 Merideth looked back out to the horizon to watch as the last shred of light dipped beneath the skyline. She thought about telling him the truth, but he wouldn’t believe it. Nobody could, without seeing it. Still, she couldn’t outright lie. Another breeze went by and the cold flooded through her body. Before she knew it Raymond’s coat was wrapped around her and the frigid air was staved off. “That’s nice of you to say, but in my ignorance I’ve been terribly rude. You can keep the coat as my apology. It was a pleasure to meet you.” He was already moving towards the direction he’d come, and Merideth was hit with several emotions she couldn’t immediately place. “How about coffee?” she called after him.